Dr. Awaida received her Bachelor of Arts degree in Biology at Vassar College in Poughkeepsie, New York, and her medical degree at SUNY Health Science Center at Brooklyn, New York. 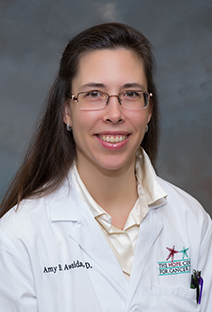 She completed her residency in internal medicine and fellowships in hematology/oncology and hemophilia/thrombophilia at Mount Sinai Medical Center in New York. Dr. Awaida is Board Certified in Hematology, Oncology and Internal Medicine, and is licensed to practice medicine in Kentucky, New York, and Ohio. She is a member of the American Medical Association and the American Society of Clinical Oncology. Dr. Awaida has received numerous awards and has been recognized throughout her career. Dr. Awaida is married and has two children. She enjoys basketball, running and travel.